In a recent series titled Fragments, I address the disjointed, scrappy, unfinished nature of identity. 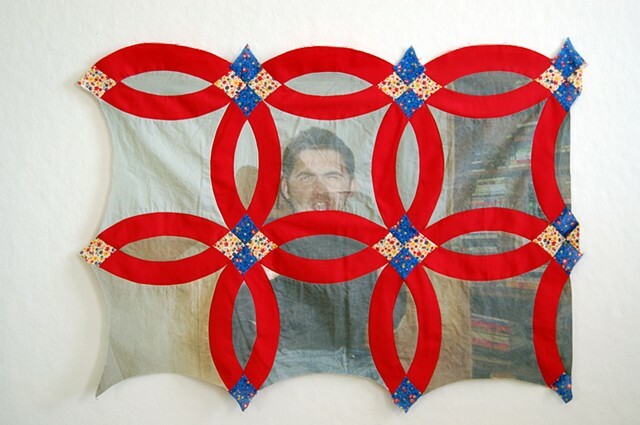 One work, Fragment #3: Roses are Red, is made by piecing a traditional quilt pattern (called Roses are Red) into an image of a heaving jock stud from a gay erotica magazine. 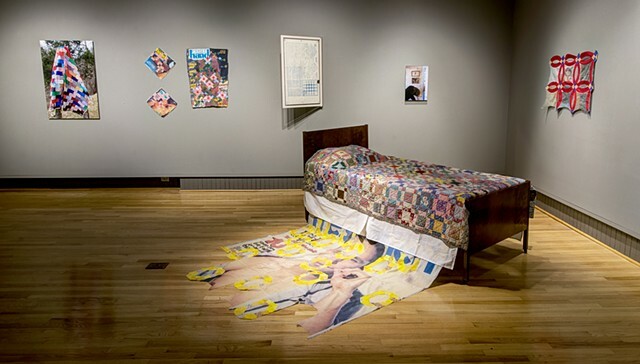 The patchwork fabrics were a grandmother’s, and the digital textile print is an enlarged scanned copy of a cover of FirstHand magazine from the 1990s. Initially, I picked this blocky quilt pattern (which is also from my grandmother’s collection) because it could partially mask the cover model’s face—a direct nod to online cruising culture in which some men blur out their faces, focusing instead on their bodies. Deliberately using feminized quilt squares to dominate the figure reveals my hesitancies around body image, appropriate sexiness and gay male objectification. In the same way that this gay masculine body is out of reach for a fag like me, so too is a fulfilling relationship with my family and their traditions. Both are just tantalizingly out of reach. So in this very literal way, I am forcing my queer desire to intersect my craft heritage, and looking for new spaces between their encounter.